I started collecting Collie books and magazines when I first became interested in the breed in 1968. It has been my goal to acquire one of everything in print on the Collie and I have come very close to that goal. I have the largest collection of Collie breed material in the world and have an entire room devoted to the collection. The collection includes books, magazines, pictures, pamphlets, pedigrees and general paper. There is a wealth of reading material available on the Collie breed. Below is a bibliography of known books on the Collie (non-fiction). Subjects range from breed history and development, bloodlines, breed pictorial studies, breed critiques, to care, breeding, training and feeding. They are an invaluable asset to any Collie owner's arsenal of information. Many of these books are over 100 years old. Many are out of print, but are still available. The older ones can be difficult to locate, but with perseverance and luck-- they are well worth the cost and effort! If you see any books missing, please let me know the title and other pertinent information. Also included is a complete list of all known Collie magazines. To see a copy of my "WANT LIST", click here! A picture of the oversized Leather bound edition of the Rawdon Lee book "The Collie or Sheepdog", published in 1890. This edition is extremely scarce with a limited edition printing of 25. Ackerman, Lowell. Dr. Ackerman's Book of Collies. T.F.H. Publications, Inc. 1996. 96pp. illust. Avery, F.W. The Care Of The Collie-Written For The Amateur. (no publisher given)  102 pp. illust. ________ The Care Of The Collie-Written For The Amateur. (no publisher given)  88 pp. illust. Baker, Thomas. The Collie: Its Show Points. White & Pike, Ltd., 1899. 26pp.illust. Baker, Thomas. 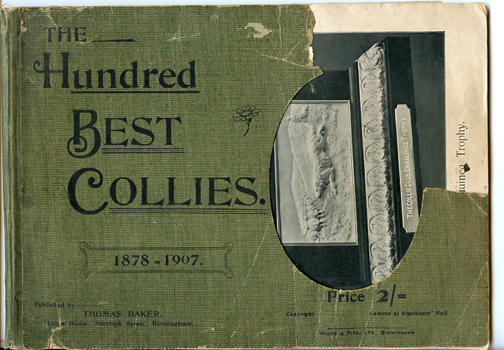 The Hundred Best Collies 1878-1907. Leigh House White & Pike, Ltd, 1907. 56pp.illust. Barbaresi, Sara. How To Raise And Train A Collie. T.F.H. Publications Inc., 1957. 64 pp. illust. Bennett, Dr. O.P. Famous Collies 1877-1917. The Washington Publishing Company, 1917. 34 pp. Illust. (all pictures). Bennett, Dr. O.P. and C.H. Wheeler. The Collie. The Washington Publishing Co, 1917. 334 pp. illust. The first concise American book on the breed. ________ The Collie (2nd printing). Washington Publishing Co, 1924. 334 pp. illust. Bennett, Dr. O.P. and T.M. Halpin. The Collie. (3rd printing). The Washington Publishing Co, 1942. 389pp. illust. Bishop, Ada L. All About The Collie. Pelham Books, 1971. 136 pp. illust. _________ All About The Collie (Rough and Smooth). Revised edition, Pelham Books, 1989. 128pp. illust. Blake, John. A Life with Rough Collies. self published. 2016. 296 pp. illust. Cartledge, Joe & Liz. The Complete Illustrated Collie. Edbury Press, 1973. 138pp. illust. Chatfield, Audrey (editor). International Rough Collie Pedigrees. 216 pp. Clark, F.R. Lessons on Training a Collie. . 12+pp. illust. cover. Clark, F.R. Common Sense Way Of Training And Caring For The Collie. (4th printing). . 23+pp. illust. cover. Clark, F.R. Common Sense Way Of Training And Caring For The Collie. (5th printing). . 30+pp. illust. cover. Clark, F.R. Common Sense Way Of Training And Caring For The Collie. (6th printing). . 30+pp. illust. cover. Clark, Stella. Rough & Smooth Collies. Ringpress Books Ltd. (UK), 1993. 176 pp.illust. Collie Club Of America. The Complete Collie. N.Y. Howell Books, 1962. 190,128pp. illust. Collie Club Of America. The New Collie. Howell Book House, 1983. 303 pp. illust. Collie Club Of America. American Collie Champions 1884-1961. 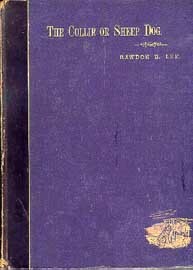 Volume I . 405pp. illust. _________American Collie Champions (1962-1976). Volume II . 528 pp. illust. _________American Collie Champions (1977-1985). Volume III . 646 pp. illust. _________American Collie Champions (1986-1992) Volume IV . 572 pp. illust. _________American Collie Champions (1993-1996) Volume V . 588 pp. illust. _________American Collie Champions (1997-1999) Volume VI . 555 pp. illust. _________American Collie Champions (2000-2003) Volume VII . 558 pp. illust. _________American Collie Champions (2004-2006) Volume VIII . 446 pp. illust. Collie Club Of America. The Collie Club Of America, Inc., Its History And Development (1886-1965). Autrey Publishing, 1972. 300 pp. Collie Club Of America. Parader - A Collection of the Writings of Stephen J. Field. Editors Gayle Kaye & George Horn. 2004. 190 pp. illust. Collie Club of N.E. National Stud Dog Directory 1977. 1977. 308 pp. illust. Collie Club of America. The Collie Breeder's Handbook. Collie Club of America, 1981. 68 pp. illust. Collie Review. The Illustrated Collie Standard. Beverly Hills California, Drucker Publications, 1958 21pp. illust. Combe, Iris. Collies Yesterday and Today. Iris Combe and JB Offset Printers, 1972. 112 pp. illust. Combe, Iris. The Smooth Collie- A Family Dog. Iris Combe. 270 pp. illust. Combe, Iris. Rough Collie Records. Kingdom Books England, 1997. 112pp.illust. Combe, Iris; Dareen Bridge; & Pat Hutchinson. Rough Collies of Distinction. Piggot Printers Ltd. Of Cambridge, 2001. 168 pp. illust. Combe, Iris & Pat Hutchinson. The Rough Collie in Society. Altone Limited, Cambridge, . 48 pp.illust. Iris Combe. Showing and Judging The Rough Collie. (no publisher, no date). 52pp. illust. Common Sense Remedy Co. Blue Book Of Dogdom 10th annual volume, Collie Standard Simplified. F.J. Skinner, . 64pp. illust. Dalziel, Hugh. The Collie: Its History, Points, and Breeding. London, L. Upcott Gill, . 58pp, Illust. Early history and Origin of the Breed. The first monograph on the breed. ___________ revised by J. Maxtee.The Collie: Its History, Points, and Breeding. 3rd edition. (Renamed: The Collie: As a Show Dog, Companion and Worker). London, L. Upcott Gill. . 96pp. illust. ____________revised by J. Maxtee. 4th edition. London, L. Upcott Gill, . 96pp. illust. ____________revised by J. Maxtee. 5th edition. The Bazaar, Exchange & Mart. . 91 pp. illust. ________Volume II. 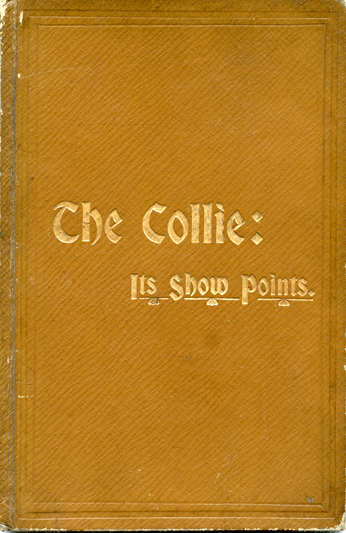 The Collie Stud Book and Show Record. Giving the winners at shows held in the United Kingdom from March 1890, to May 1891, and the pedigree of each winner and of many other noted dogs, traced back to their most remote known ancestor. London: L. Upcott Gill. . 124 pp. ________Volume III The Collie Stud Book and Show Record. Giving the winners at shows held in the United Kingdom from June 2, 1891 to April 22, 1892 and the pedigree of each winner and of many other noted dogs, traced back to their most remote ancestors. London: L. Upcott Gill,  122 pp. Denlinger, Milo G. A Blueprint Of The Collie. Washington D.C., Denlingers, 1945. Drawings by Edwin Megargee. 96 pp. illust. (hard or soft cover). Dorsten, Cindy. Celebration of The Working Collie. Alpine Publications, 2001. 169 pp. illst. Durham, Roz. Your Collie From Kennel To Show Ring. Collie Club Of America, 1968. 31 pp. illust. Instructional grooming of the Collie. Elkins. Allene Hoke. An Illustrated Look At The Collie Standard. Illustrated by the author. Collie Cues Press. 2nd printing . 60pp. ________3rd edition (Revised). An Illustrated Look At The Collie Standard. Illustrated by the author. Collie Cues Press. . 76 pp. Esch, Vern. The Smooth Scene. Privately published, 2017. 302 pp. illust. Ford, Dr. Lee. Collie Genetics And Breeding. Volume I. Shamrock Press, 1955. 62 pp. illust. Ford, Dr. Lee. Collie Genetics And Breeding. Volume II. Shamrock Press, 1956. 80 pp. illust. Ford, Dr. Lee. Collie Genetics And Breeding. Volume 13. Shamrock Collie College. Shamrock Press, 1957. 110 pp. illust. Ford, Dr. Lee. Collie Genetics And Breeding, The White Collie. Volume I8. Shamrock Press, April 2, 1957. 97 pp. illust. ________Collie Genetics And Breeding. The Smooth Collie. Volume 23. Shamrock Press, 1957. 100 pp. illust. Ford, Dr. Lee. Collie Genetics And Breeding, The Blue Merle Collie. Volume 24. May 1957. illust. ________Collie Genetics And Breeding, An Illustrated History Of The Collie. Volume 28 and 29. Shamrock Press, 1957. 152pp. illust. ________Collie Genetics And Breeding, Geriatrics. Volume 32. Shamrock Press, 1958. 112 pp. illust. Hall, J.F. Real Collies We Have Known. The Christopher Publishing House, 1943. 55pp. illust. Hunt, Hazel. Rough Collies. Howell Book House, 1990. 256 pp. illust. Hunt, Hazel. The Rough Collie- Companion and Showdog. Sharmar Publications, 2003. 286 pp.illust. Johns, Rowland editor. Our Friend The Collie. L., Methuen & Co, LTD., 1934. 86 pp. illust. (Our Friend The Dog series). ________2nd edition. L., Methuen, Our Friend The Collie.1946. 86 pp. illust. ________3rd edition. L., Methuen, Our Friend The Collie. 1950. 86 pp. illust. ________4th edition. L., Methuen, Our Friend The Collie. 1952. 86 pp. illust. ________5th edition. L., Methuen, Our Friend The Collie. 1954 (reprinted 1962). 91 pp. illust. ________American Edition. Our Friend The Collie. E.P. Dutton and Company, 1936. 86 pp. illust. Kattell, Ted. Pet Collie. All-Pets Books, Inc., 1954. Illustrated by Lorraine B. Still. 64 pp. illust. ________Second printing, Pet Collie. All-Pets Books, Inc., 1957. Illustrated by Lorraine B. Still. 64 pp. illust. ________third printing, Pet Collie. All-Pets Books, Inc., 1957. Illustrated by Lorraine B. Still. 80 pp. illust. Kaye, Gayle. A Century of Collies. Collie Expressions, publisher, 2004. 164 pp. illust. Kaye, Gayle. The Collie in America. self-published, 2009. 472 pp. illust. Maxwell Medallion winner and DWAA President's Award (2010). Lee, Rawdon B. The Collie Or Sheep Dog (A History And Description Of The Collie Or Sheep Dog In His British Varieties); illustrated by Arthur Wardle. London: Horace Cox, 1890. 157 pp. illust. (came in standard book and over-sized Deluxe Leather-bound edition). ________Reprinted Peregrine Books. The Collie Or Sheep Dog . 157, 32 pp. illust. Mangels, Trudy. Evolution Of The Collie. Trudy Mangels, 1962. 256 pp. illust. _______2nd Printing, Evolution Of The Collie 1972. 393 pp. illust. Mangels, Trudy. Color Inheritance in Collies. 8 pp. illust. McCloskey, Esther. This Is The Collie. T.F.H. Publications, 1963. 254 pp. illust. Miller, Madeline. Collies As Pets. TFH Publications, 1955. Illustrated by Three Lions, Inc. 32 pp. illust. Nicholas, Anna Katherine. The Collie. T.F.H. Publications, Inc., 1986. 320 pp. illust. Osborne, Margaret. The Popular Collie. Arco Publishing Co., Inc., 1957. 256 pp. illust. _______2nd edition. The Popular Collie.1960. 256 pp. illust. _______3rd edition. The Popular Collie. 1962. 256 pp. illust. _______4th edition. The Popular Collie. Revised and Reprinted (as The Collie). Popular Dogs. 1965. 240 pp. illust. _______5th edition. The Popular Collie. 1966. 240 pp. illust. _______6th edition. The Popular Collie. 1969. 240 pp. illust. Osborne, Margaret editor. The Collie Association Handbook. Renault Printing Co., 1952. 142 pp. illust. Packwood, H.E. Show Collies: Rough And Smooth Coated. Manchester, 1906. 124 pp. illust. _______Reprinted Peregrine Books, Show Collies: Rough And Smooth Coated 1990. 177 pp. illust. Pasco, Luke J. Heather Jean The Working Sheep Dog. Sheep Breeder, Inc., 1937. 127 pp. illust. Puxley, W. Lavallin. Collies And Sheep-Dogs. London, Williams & Norgate, 1948. 79 pp. illust. _______Reprinted, 1949. Collies And Sheep-Dogs. Williams & Norgate. 79 pp. illust. Pickhardt, Edwin L. The Collie In America. F.J. Skinner, 1924. 78 pp. illust. Quarter Century Collie Group. Golden Memories. 2012. 223 pp. illust. Roos, Mrs. George H. (Bobbee). Collie Concept. Alpine Publications, Inc., 1982. 212 pp. illust. _______Revised Collie Concept. 1988. Alpine Publications. 212 pp. illust. Rogers, W.H. Training and Care Of Collies. 1901. (other particulars unknown). Rogers, Edwin Andrew. Training and Care Of Collies (Dedicated to breeders and trainers of America).1904 Second edition. English Books/Text 33 p. illus. 20 x 15 cm. Dundee, Mich.
Rogers, Edwin Andrew. Training and Care Of Collies (Dedicated to breeders and trainers of America).1921 Fifth edition. English Books/Text 33 p. illus. 20 x 15 cm. Dundee, Mich.
Sargent, W. A. 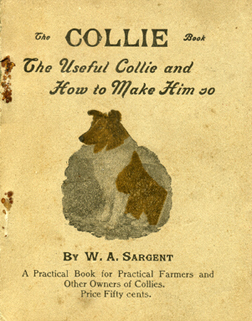 The Collie Book....The Useful Collie and How to Make Him so. 1902. 66 pp illust. Schneider, Earl editor. Enjoy Your Collie. The Pet Library, LTD. 2nd printing 1967. 32 pp. illust. Shryock, Patricia Roberts. All About Collies. NY Orange Judd Publishing Co., 1961. 153 pp. illust. Breeding and Showing information. ________Revised, 2nd edition. All About Collies. Orange Judd Publishing Co., 1968. 164 pp. illust. ________Third edition (under name Patricia Roberts Starkweather). All About Collies. Orange Judd Publishing Co., 1980. 170 pp. illust. Starkweather, Patricia Roberts. The Magnificent Collie. Doral Publishing., 1997.312 pp. illust. 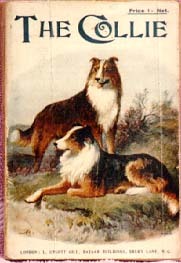 Still, Lorraine B. Illustrations Of The Collie, His Character and Conformation. The Collie Club Of America, Inc., 1961. 30 pp. Illustrated by author. Summy, Catherine editor. The Smooth Collie- "Brother To The Rough". (1967 Yearbook). American Smooth Collie Association. 87 pp. illust. ________The Smooth Collie. American Smooth Collie Association. 2nd edition, 1974. 128pp.illust. Sundstrom and Sundstrom. Collies: A Complete Pet Owner's Manual. Barron's Educational Series. 1994. 96 pp. illust. VDB. The Collie...A Complete Anthology of the Dog 1860-1940. Vintage Dog Books. 2010. 204 pages. illust. Vanderlip, Sharon Lynn. The Collie A Veterinary Reference For The Professional Breeder. Biotechnical Veterinary Consultants, 1984. 296 pp. illust. Wharton, Alice. A New Owner's Guide to Collies. t.f.h. publications. 1998. 160pp. illust. Wilcox, Charlotte. The Collie. Capstone Press. 1999. 48 pp.illust. Wickham, W.A. Practical Training Of The Shepherd Dog (with a few chapters on Dogs in general, and the Collie in particular). W.A. Wickham, 1891. 120pp. illust. Young, Ann. Pet Library. The Pet Library, 1969. 250 pp. illust. A recent addition to my collection, the above book is probably the scarcest Collie book ever printed. I was not even sure of its true existence because I have never known one single person who owned a copy nor has anyone ever seen a copy. This includes old time breed experts in Britain. All I had to go on was an obscure ad in an old "Collie Folio", indicating the book was "ready shortly". I was never sure it actually went to print. After having this book on my want list for 35+ years, I was recently contacted by a book dealer in England. He found this copy at a charity shop in Nottingham and gave me first offer of refusal. Unfortunately it is missing some pages and part of the cover......nonetheless, I am thrilled to add this very scarce book to my collection. I am still seeking an intact copy! Another very scarce early book on the breed. I have the only known copy. 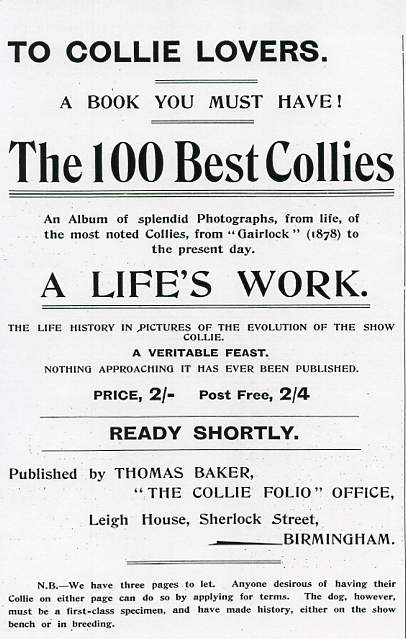 Compiled by Thomas Baker (who was the founder and early owner of the Collie Folio magazine). The book has no publication date but ads in the back, date to 1899. Collie Cues. Collie Cues Press, Castro Valley, Ca. 1948-1982. Collie Expressions. Nancy McDonald, Manassas, Va. 1992 to present. Collie Review. Collie Review Publishing Co., NY 1930. Collie Review. Drucker Publications, Los Angeles, (later Leslie Rugg,) 1946-to 1996. Collie Variety. Hoflin Publishing, LTD., Colo. Bi Monthly, Mar/Apr 1987 to Fall 1991. Just Collies. Published by CCA. Editor, Miss Genevieve Torrey. New Jersey, 1922-1923. Scotch Collie Fancy. (Later Collie Fancy), James Norris, Wisconsin, 1945-1946. The Collie Folio. England, 1906-1917. The Collie. (Later combined with The Kennel Review), published by Buttles, Kalamazoo, Michigan, circa 1907. H.E. 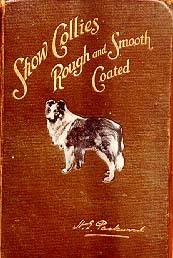 Packwood's wonderful but scarce book, "Show Collies, Rough and Smooth Coated".